Inner liners create a tight seal. Perfect for travel, and conveniently fits in your purse. Category: Misc. Part Number: THRGJ010812. Color: Amber. Inner liners create a tight seal. Perfect for travel, and conveniently fits in your purse. I cannot cancel orders. Comfortably holds a few grams. Make sure this fits. by entering your model number. Item model number: pvcrj1z12. The biggest factor for the popularity of our 5 ml glass dropper bottle is it's performance and versatility. Light proof Yes, this is what really sets us apart. All Infinity Jars glass is designed in a lab (after years of rigorous research) with the specific intent to prevent light from degrading whatever is inside. (Comfortably holds a few grams. - Local pick up is not available. - If you receive an item and it doesn't work properly or you don't like it because of any reason at all. c) If item was opened, any parts removed or repaired by any unauthorized person. Amber glass is perfect for protecting the contents of this glass jar from harmful of UV rays. SEAL TIGHT - Inner liners create a tight seal. Amber Glass Protects Against Harmful UV Rays. Mini-sized jar.Perfect for travel,picnic, and conveniently to take. Mini Mason Spice Jar with Dispenser Lid 4oz (4, black). Category: Food Dispensers. Perfect 4 oz. Size for storing herbs and spices. Ball 4oz Mini Jar with Pour and Sift Lid. Use shaker lid for spices, sprinkles, candy, sugar, nuts. Perfect for travel. Fits in purse. We only provide products we ourselves would be proud to have in our own yard. Make sure this fits. by entering your model number. Product Information. Trending at $28.05eBay determines this price through a machine learned model of the product's sale prices within the last 90 days. 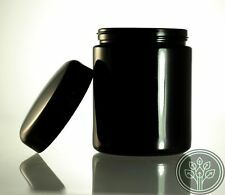 These high quality, amber, glass, round jars are perfect for use with lotions, s, and scrubs. We do not accept P.O. Boxes. Add to Favorite. We're happy to help.